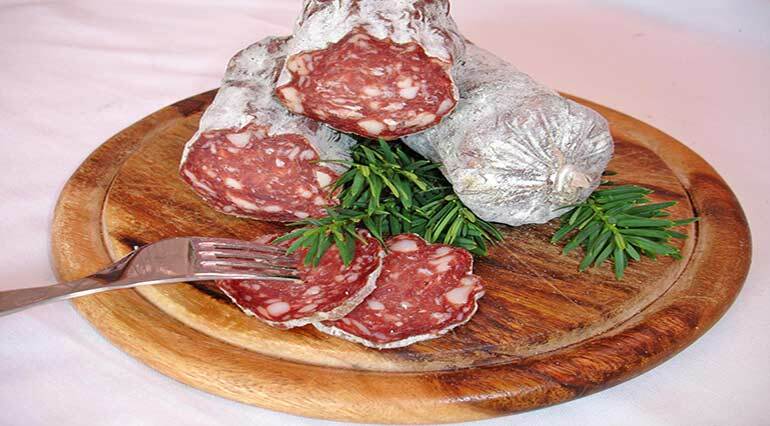 Abruzzo salami is made all over regional territory: it is raw, medium-grain charcuterie made from fresh pork, left to hang for one or two days at low temperature and then meticulously skinned, boned and cleaned of the main connective tissue (tendons and aponeurosis) and the low-melting soft fats. 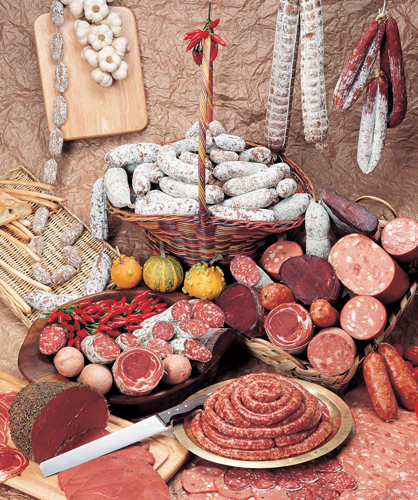 The cuts of pork generally used are the shoulder, the belly, trimmings from hams and loin, in variable proportions (usually: 70% lean cuts and 30% of belly and/or ground meat). 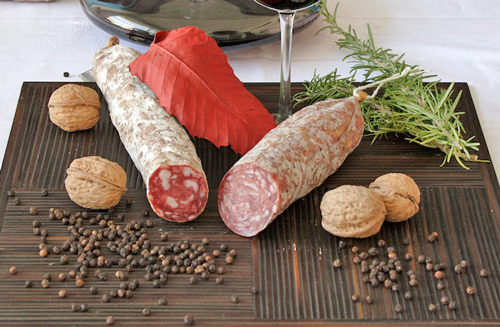 The salami is cylindrical or slightly conical, and often uneven, with casings made from pork or veal “dritto” (the colon), or veal “bondeana” (caecum), and is tied at both ends with a medium-gauge twine. The exterior is dry and may have some widespread, natural white flocking tinged with orange and/or green, especially if industrially produced. The red, smooth paste is medium-large grained and lean. 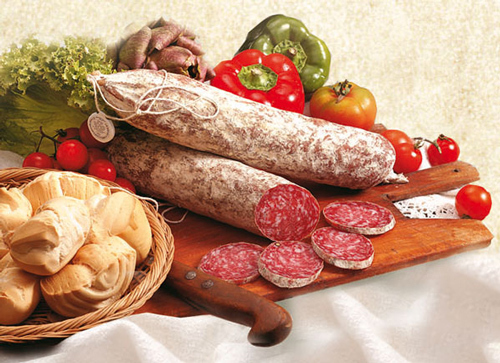 After casing and binding, the salamis are ripened in controlled conditions and, in any case, at temperatures that do not exceed 15°C, for anything between 25 and 180 days, and precisely, at industrial level, between 100-180 days. 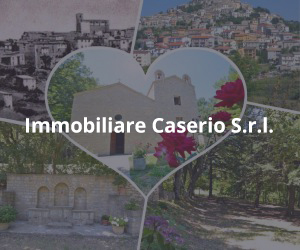 In Abruzzo most families bred pigs, not just for the meat, which was mainly cured, but also for the lard, suet, dripping, and the “stuffing”, used as a condiment for soups instead of oil. The hams and shoulder were eaten on special occasions, as were sausages and salamis, which were offered for lunch to the farm day labourers. 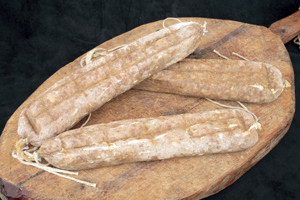 Important references to this particular type of sausage can be found in the Ancient Chapters of the Town of Lanciano (1592), kept in the town’s historical archives. 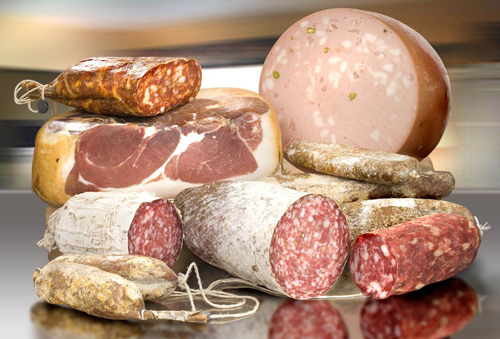 Countless clauses regulated the quality and weight of the meat, but also guaranteed daily supply, suggesting the existence of several “buccieri” (butchers) and “pizzicaroli” (grocers).